I doubt it'd make too much difference - they may be fearless, however i can't imagine that the life expectancy of a mouse which doesn't run away from cats or foxes will be much greater than a few hours or daylight, or half an hour during the night, in the wilds of suburbia. Either way, I suspect they won't have time to breed. It sounds like toxoplasmosis, except in that case the mouse is drawn to the scent of the cat...interesting stuff. Does this mean it is not far behind and we will identify the gene to make us successful or lucky as in Harry Potter's Flex Felicia potion? Or maybe even a financial wizard? Lol, as long as they don't release them? what would happen if an animal, devoid of the normal fear of predators is released into the wild???? I hope no public money was spend on this ... I think it's pathetic and if the team wanted to prove something to the world, they could have found a better test subject. I smeel a plot to secure jops in the pest control business. Now people who have cats will STILL a mouse problem. "Great! How long until we can breed stupidity out of people?" @ "Darwin" -- You're a moron, and your use of that name is nothing short of offensive. @ ws -- I agree! This could be useful for the pet industry! @ erika -- not quite, this is the deactivitation of a fear response routine, not the addition of an attractant. Okay, you've all been served. My work here is done. i love how they always choose cripplingly adorable pictures for these articles. 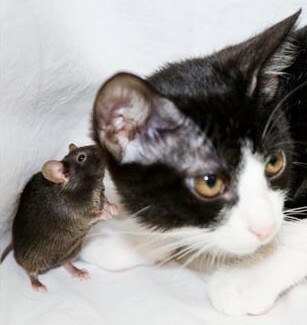 "Scientists remove fear of cats in mice, create infinte cuteness engine"
and why is the cat not attacking the mouse? What an idiot. Who chooses to use the name of a DEAD GUY who had a ridiculous theory, then denied his theory before death? Great choice of names... It really fits you. At least the REAL DARWIN was smart enough to redeem himself. see you littel cute self. If you're talking about the photo, it's just a photo taken of the Internet, nothing to do with the experiment. It's not that the mice in the photo is the fearless mice itself. Alot of times if its a domestic cat the cat isnt trying to attack and kill the mouse they kill it while playing with it. There is a chance, that the cat is just not interested. No, the scientists are controlling the cat too! Hope they won't allow them to reproduce. . .
cute idea. There's an old bar trick that illustrates this action in humans. You put a rattlesnake in a glass jar and bet someone that they cannot hold their hand on the jar while the snake strikes. It can be learned, but even people that have never seen a rattlesnake have a hard time not drawing back. This is baloney. Just watch funny home videos...a mouse that is raised with a cat won't fear moat cats. Just like a cat raised with a dog won't fear most dogs. I think the whole idea is silly. How about genetically modifying German Roaches so they DIE...you know- something useful. It wouldn't matter if they did reproduce. they would get wiped out first time they stepped outside there tunnel. And i hope the posters of this article, and the people posting stupid responses aren't allowed to reproduce. EVER. It would be for the good of all mankind. In the wild, a blond thought such as those would get the thinker taken out of the gene pool, very quickly. Well, if they do reproduce and go into the wild, they'll probably all get eaten. /dev/random » Blog Archive » Where are we going?